This next car comes from Tanj! who writes: Not mine. Saw this as part of my morning searches. 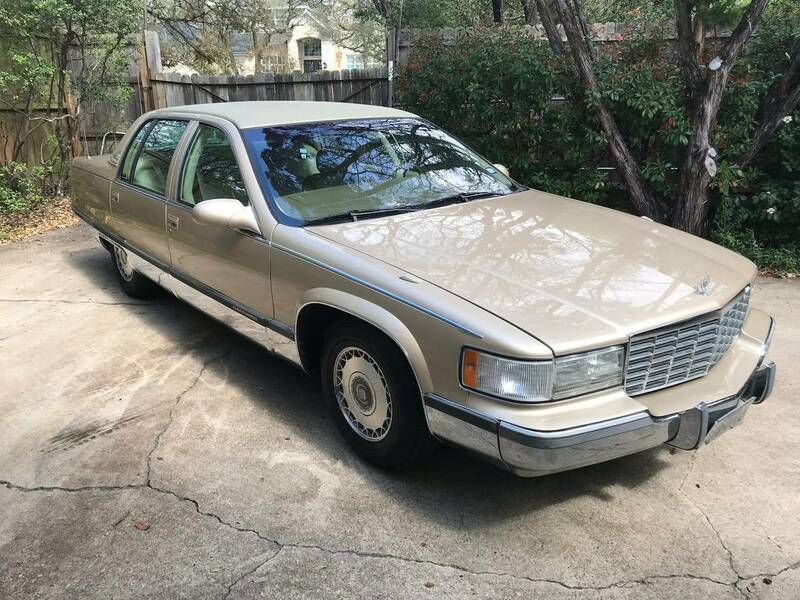 Low mile 1995 Fleetwood Brougham for sale in Austin for $4.3k. Leather seats look presentable. All chrome bits are intact and look undamaged. Even better all the plastic trim bits on the chrome and bumpers appear undamaged. Same for the reverse lights (between the bumper and rear sail panel). 95 starts the beginning of the larger side mirrors moved up from the doors and is the last year of OBD-I and first year of the PWM improvements made to the transmission for better shifting feel. And it looks like the seller might be an enthusiast for the brand or model as their is another D-Body in the background of one of the photos. The seats are creeping me out. They look like they are lacking structure. From the photos they are the only negative on that car that I see. 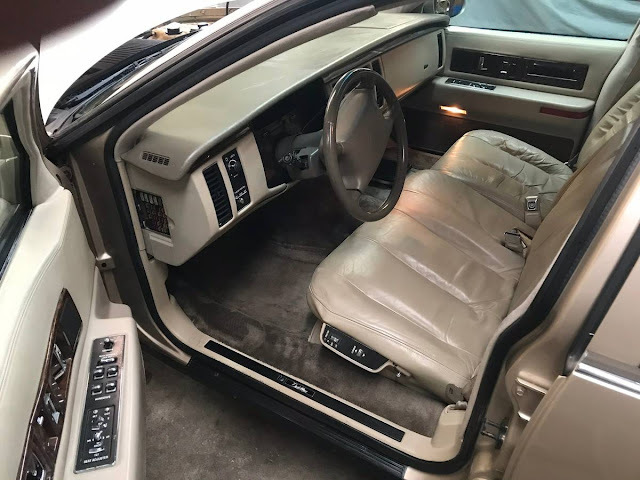 The leather seats used in the B/D-Bodies don't seem to stand up to the test of time. This seems to be that intermediate state between them looking good and having giant holes in them. I've got cloth seats in Fleetwood and like them even though they are the base model. The cloth seems to wear really well. You regularly see high mileage Caprice's (which predominantly had cloth) with their seats still in good shape. It was possible to get the upgraded heated seats in cloth but exceptionally rare to find in my experience. Re-covering the seats with new skins is apparently fairly easy to do with these. This is totally random, but the size of the ENG/MET and TRIP RESET buttons on dash makes laugh. It's like the visual equivalent of screaming in the driver's ear, "WE KNOW YOU'RE OLD AND CAN'T READ OR SEE FOR SH!T"
My Dad drives a town car. When one goes into a turn you actually turn three times. Once to initiate, second time to sink and fold the tires, third time to correct the oversteer. It has knobs, loud turn signal feedback, and funny large icon buttons. I absolutely hate it and secretly like it all at the same time. Ahem, somebody call my name? So is this a Northstar V-8?